New Delhi, India (May 21, 2013) – More than 100,000 women have decided on a long-acting family planning method following the birth of a child, a significant achievement in the government of India’s efforts to expand access to contraceptives and reduce maternal deaths. The acceptance of the postpartum intrauterine contraceptive device (PPIUCD) by so many women is an endorsement of the Ministry of Health and Family Welfare’s decision to promote and strengthen postpartum family planning (PPFP) services at a national level. It also reflects a paradigm shift in the country’s family planning strategy, from limiting to spacing births. Family planning is now looked at as an essential intervention to improve the maternal and child health conditions in India, a country with 26 million births a year and one of the highest rates of infant deaths (44 per 1,000 live births vs. 6 per 1,000 live births in the United States) and maternal deaths (212 per 100,000 live births vs. 21 per 100,000 live births in the United States). Reaching the threshold number of 100,000 PPIUCD acceptors also underscores the huge potential that exists to save lives through scaling up this family planning service, which can be provided immediately after a woman gives birth. 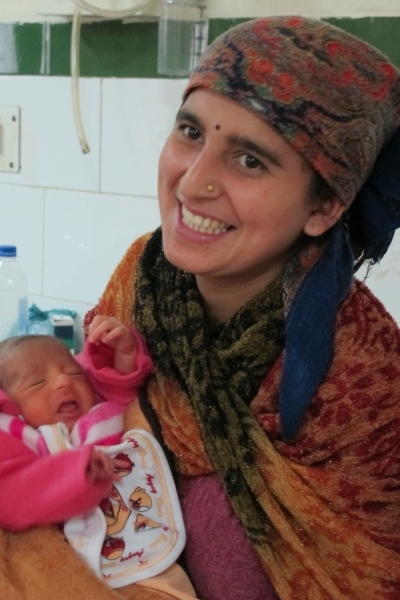 A high unmet need for family planning exists in India, especially in the postpartum period. Since 2010, Jhpiego has been providing technical assistance to the government to strengthen PPFP/ PPIUCD services at the national and state levels. Jhpiego’s work has coincided with the government’s efforts to promote the health and safety benefits of giving birth in a health facility. Through the Janani Suraksha Yojana (JSY) program, women received a cash incentive to give birth in a health facility. As more women participated in JSY, the interest in PPFP grew. By the end of 2010, more than 10 million women had already benefited from JSY. To meet demand for PPFP services, more than 1,600 providers have been trained in PPIUCD service delivery and over 3,000 dedicated counselors, providers and community health workers have received key counseling messages to share with clients. In a country where IUCDs have traditionally constituted less than 2% of contraceptive methods chosen by women, the government’s decision to reinvigorate this method in the postpartum period and include it the basket of family choices available at public health facilities has had a substantial impact on expanding use of family planning. Jhpiego is now working with the Ministry of Health to scale up PPIUCD services in 150 districts in six high-focus states: Madhya Pradesh, Chhattisgarh, Bihar, Rajasthan, Uttar Pradesh and Jharkhand. · Institutionalized services at delivery sites by training providers within the facility to provide services competently, according to established standards, and orienting all staff (including paramedical) about the benefits and strengths of these services; ensuring high-quality training and post-training follow-up and emphasizing quality of services including infection prevention practices, training management and monitoring. · Strengthened counseling at facility level by ensuring that all providers, including nurses, are trained in counseling skills. Essential counseling materials like job aids and posters were made available to all intervention sites. The audio-visual medium was used for behavior change communication in the waiting areas of the facilities. Community health workers were trained to create awareness about PPFP/PPIUCD. · Improved follow-up by establishing a follow-up mechanism and regularly monitoring all clients. Regular systemic review of service data was conducted.